Be part of a larger, stronger voice on issues and legislation that affect the hospitality industry in the Bluegrass. BHA continually monitors important local hospitality legislation and strives to be heard on relevant issues. Take advantage of meeting others in the local hospitality industry! Feature your organization in the Member Spotlight section of the newsletter and website. Enjoy social gatherings and invest in the future of the Bluegrass hospitality industry by participating in the annual Bluegrass Hospitality Games. Attend informative and educational meetings and events at discounted rates. Network at a BHA event, “like” the BHA Facebook page, and follow us on Twitter @BHAhospitality. The Bluegrass Hospitality Games is a fun event where teams compete in a series of games to raise money for the BHA’s scholarship initiative. The BHA has awarded numerous scholarships to local students seeking a career in the hospitality industry. Any restaurant or spirit producing organization in the bluegrass area licensed by the state may apply for membership in BHA in either small (less than 10 employees) and large (over 10 employees) categories. Any private sector individual, partnership, firm or corporation engaged in industry related activities (ex.) may apply for membership in the BHA. Any private sector supplier, vendor, or other organization engaged in industry related activities (ex. printers, audio visual companies, landscapers) may apply for membership in the BHA. Attend informative and educational meetings and events at discounted rates. See our calendar of fun and exciting events! Be part of a larger, stronger voice on issues and legislation that affect the tourism industry in Kentucky. You represent an important piece of the tourism industry in this region and we need your ideas and voice to make a difference. Increase your business and understand challenges facing your clients. BHA strives to provide opportunities that will increase business for its members. Give back by investing in the future of the Bluegrass hospitality industry. Every year BHA holds its annual fundraiser to raise money for scholarships to support students who want to make hospitality a career. Take advantage of leadership opportunities including serving on the BHA Board of Directors or volunteering at one of our events. The BHA membership term runs from July 1 – June 30. New members that join from July through December are expected to pay the full cost of membership. Membership dues will be prorated after 6 months, on a monthly basis. For example: If a new member joins in January, their payment will be for half of the full cost of membership. Looking to contact a fellow BHA member? Download the current member directory. 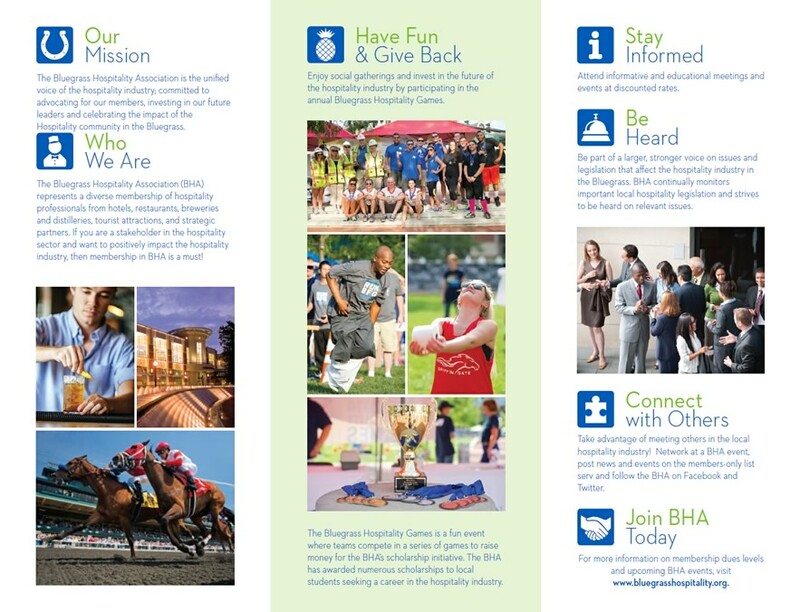 Click the image below to download the BHA membership brochure. Be part of a larger, stronger voice on issues and legislation that affect the hospitality industry in the Bluegrass.